The normal cycle of hair growth and loss.. In males thinning of hair is present at the crown of head but hair thinning is absent at the sides and rear of head. Women do not suffer classic male pattern baldness. In women, the hair becomes thinner all over the head, and the hairline does not recede. Alopecia universalis is due to unknown cause in which there are well defined bald patches, usually round or oval, on the head and other hairy parts of body. Alopecia areata tends to be rather rapid and often involves one side of the head more than the other. Alopecia areata or alopecia universalis affects both males and females. alopecia areata is caused by an abnormality in the immune system. alopecia universalis in india is sometimes associated with other autoimmune conditions such as allergic disorders, thyroid disease, vitiligo, lupus, rheumatoid arthritis, and ulcerative colitis. Sometimes, alopecia areata occurs within family members, suggesting a role of genes and heredity. In this case, there is a premature cessation of anagen growth, which causes partial hair loss throughout the scalp. No distinct patches are evident. It may not be possible to identify the disease clinically, as it can be mistaken for telogen hair loss, which is diffused hair loss caused by stress, certain physical conditions like puberty or childbirth, chronic illness, or trauma. It is also similar to anagen effluvium, which is hair loss in the anagen stage due to chemotherapy or radiation treatment. In some cases of hair loss on top of the head, it also resembles typical male or female pattern of hair loss or even trichotillo where people pull out their own hair. A biopsy is perhaps the best way to diagnose the disease specifically. Dermatologists also look for the exclamation type of broken hairs as indication of alopecia areata. Alopecia totalis is the loss of all hair on the scalp. The whole scalp is affected and there is 100% hair loss which leads to a bald head. Alopecia totalis involves the rapid loss of hair most sufferers are children and young adults under the age of 40, though it can affect people of all ages. Alopecia Totalis is an auto-immune disorder. Complete hair loss occurs throughout the body. This includes the head (as with alopecia totalis) but also the arms, legs, chest, pubic hair, etc. Alopecia universalis in india is occasionally an extention of alopecia areata and effects both men and women as well as childrens. Alopecia areata barbae occurs in men. It is the rapid loss of hair around the beard area. Like other forms of alopecia areata, a small patch of baldness will appear (in the case of alopecia barbae in the beard area), and then expand from there on out. The final outcome is usually a patchy beard. 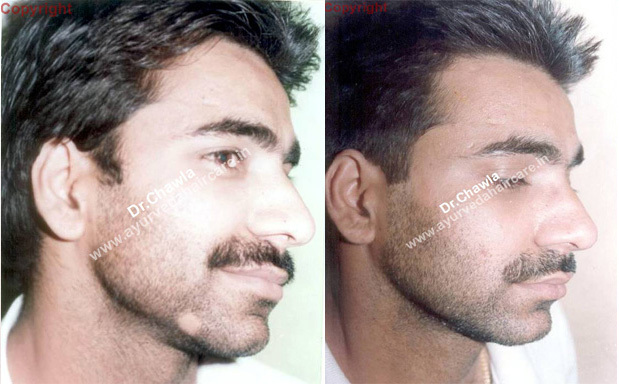 The patches of hair loss usually start occurring around the chin area, and/or neck areas. In this form of disease, bald patches may not be found but there is hair loss in irregular patterns in a net like fashion. In the scalp, there are regions of hair loss interspersed with areas with normal hair growth. When affected with reticulated alopecia, patients may have hair falling from one region but new hair growth in another region. This phenomenon may for many months or years. Traction alopecia universalis refers to hair loss which occurs do to traction or excessive rubbing on hair at the base of the scalp. Traction alopecia is commonly seen with braids, pony tails and other hairstyles which create traction on the scalp. If this happens, it’s best to choose hairstyles that put less pressure on hair roots along with our herbal treatment . The sooner this is done the better to avoid permanent damage. Trichotillomania is a type of psychological condition that involves strong urges to pull out one’s own hair. Trichotillomania affects more girls than guys. Most people who have it develop it during adolescence. But trichotillomania can start in kids as young as 1 year old. Alopecia mucinosa usually presents as slightly scaly bald patches in which the follicles are unusually prominent. Most common sites of involvement are the face, neck and scalp, but any part of the body may be affected. Anagen Effluvium a significant loss of hairshafts in their Anagen phase. The onset may be rapid (e.g. within 2-4 weeks of the cause). Major hair loss may result in extreme cases. Hair re grows spontaneously. • Seborrhoeic dermatitis and other localised dermatoses. Stress related hair loss, temporary hair loss. • Pyrexia (in particular a body temperature of 102.5 C). The term “cicatricial alopecia” refers to a diverse group of rare disorders that destroy the hair follicle, replace it with scar tissue, and cause permanent hair loss. In some cases, hair loss is gradual, without symptoms, and is unnoticed for long periods. The word ophiasis come from the Greek word snake. The hair is lost in the region above the ears and neck. 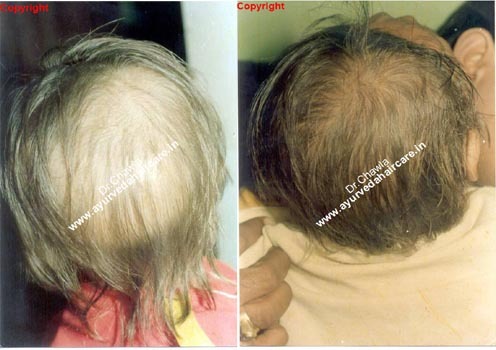 It is alopecia areata, but restricted to this region. In the initial stages, it may develop as a single patch and then spread. An excessive amount of scaly material composed of dead, keratinized epithelium shed from the salp that may be a mild form of seborrheic dermatitis. Due to dandruff.Alopecia Universalis: : This is the disorder in which hair starts falling and leave patches on scalp, beard, moustaches or any other part of the body. It leaves a shiny skin behind. In few diagnosed cases, hair may grow back in sometime but in many cases the disease goes to its next level where the hair from whole scalp can be lost and this condition is termed as Alopecia Totalis. On the other hand, if the patient still does not plan for the treatment then the disease can progress to its more worsen condition where hair can be lost from the whole body and not any single hair will be left even inside the nose or the pubic area. 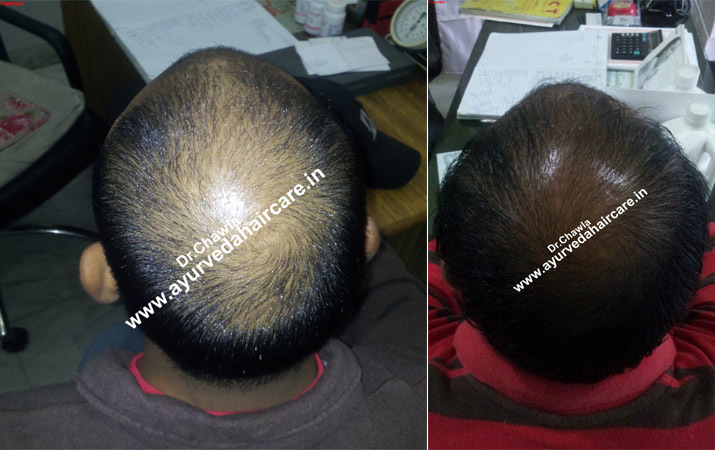 This Drastic hair less condition is known as Alopecia Universalis.According to this disease, this will not provide any kind of discomfort, pain or physical trauma to the patient and will not hamper his/her daily routine activities but it can hurt you mentally, as it will make patient to feel embarrassed cosmetically. In some cases, patients accept their bald looks very confidently in society which does not affect their mental level but many patients, who are very possessive about their looks will start feeling embarrassed which will ultimately last a bad impact on its physical condition. As we know, females feel sophisticated when they have good looks but if they are facing hair loss like diseases then they can take more stress regarding their problem which is not good. 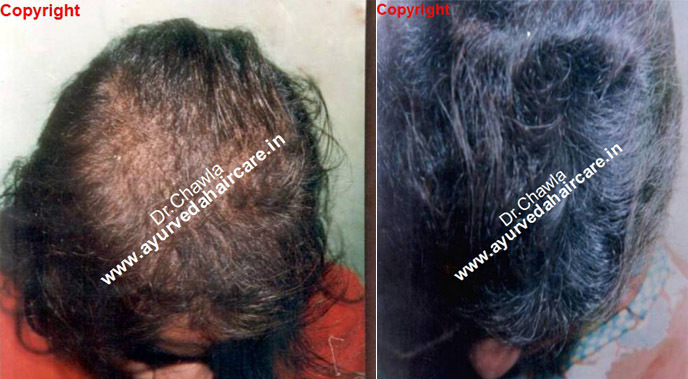 We Provide Ayurvedic treatment for alopecia universalis. Complete hair loss occurs throughout the body. This includes the head (as with alopecia totalis) but also the arms, legs, chest, pubic hair, etc. Alopecia universalis is occasionally an extention of alopecia areata and effects both men and women as well as childrens.